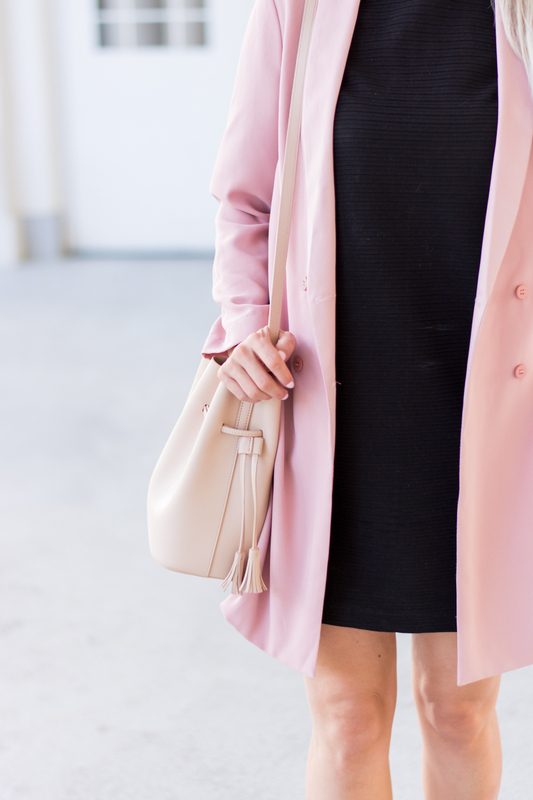 OOTD - Pink For Fall | La Petite Noob | A Toronto-Based Fashion and Lifestyle Blog. If you haven't noticed in the stores, pink seems to be everywhere for Fall - and this girl couldn't be happier! Finally I can indulge in my love for the girly shade, without garnering the reaction of "wow, that girl really likes the colour pink." To celebrate, I paired my two favourite pink pieces for fall together: an oversized pink blazer and my Geox pink New Symphony block-heeled shoeties. The result is the perfection transitional summer-to-fall everyday outfit, while still staying on-trend. I honestly cannot say enough good things about these Geox shoes. Comfortable would be an understatement, as I often walk all around the city in them without problem. I also absolutely LOVE the colour and love how these is a subtle sparkle throughout the shoe. Needless to say, I will be sporting these babies on the regular, as long as the weather will allow for it! What do you guys think? Are you as happy as I am that pink is a staple colour for fall, or are you more into neutrals? What do you think about the shoe? Let me know! Generally, I dislike pink (it's too girly princess for me) but in subtle tones I'm fine with it. Like I have a blush oversized blazer that I pull it sometimes as a statement piece!